This whole grilled golden trout stuffed with lemon, dill, and garlic served alongside an ear of grilled Ohio sweet corn is tasty summer simplicity at its finest. The golden trout is lightly perfumed with the citrus of the lemon and flavors of dill and garlic with crispy, lightly charred skin and tender, flaky flesh. The natural sweetness of the corn is coaxed to a new level from the caramelization on the grill, making this some of the best corn I’ve ever eaten. 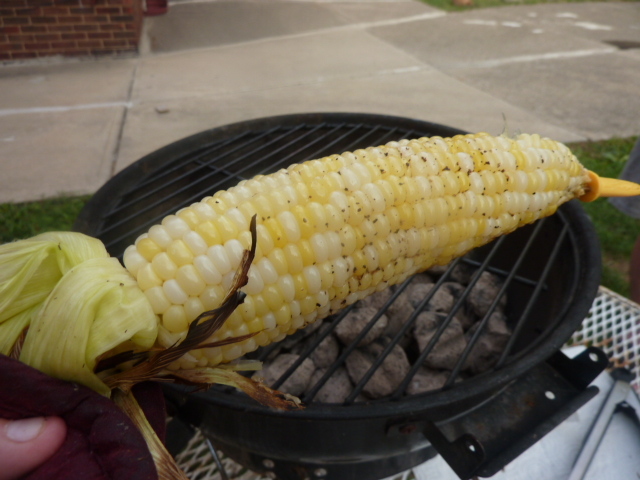 The husks prevent the kernels from burning, while allowing the smokey charcoal flavors of the grill to make their mark. I cooked the corn on the grill first before cooking the fish because our grill is tiny and it acted as a great appetizer. If you have a big grill, then there’s no need to do that. 1 whole golden trout, weighing approximately 1 lb. Make sure all cavities in the fish are empty and trim off all fins using a pair of kitchen scissors. Cut three deep slashes in each side of the fish, to but not through the bone. Rub fish inside and out with olive oil. Season the inside of the cavity of the fish, the slits cut into the fish, and both sides of the fish liberally with salt and pepper. Squeeze a tablespoon or so of lemon juice into the cavity of the fish. Stuff the cavity of the fish with most of the lemon wedges, dill, and most of the chopped garlic. Stuff remaining chopped garlic into each of slits cut into the fish. 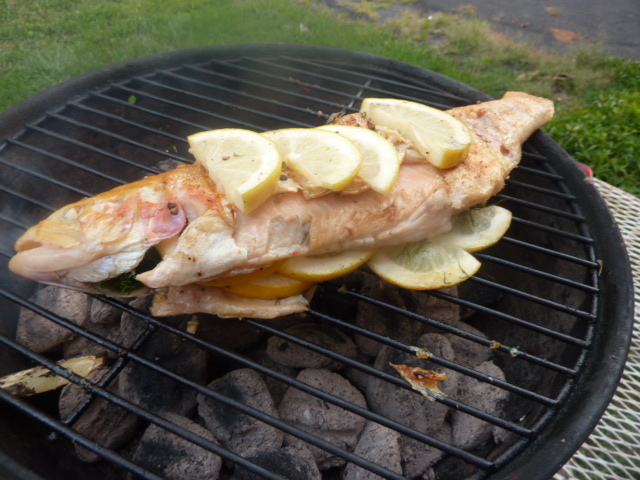 Place a few slices of lemon both under and on top of the fish. Let marinate, refrigerated, for about an hour (not necessary but I believe helpful). 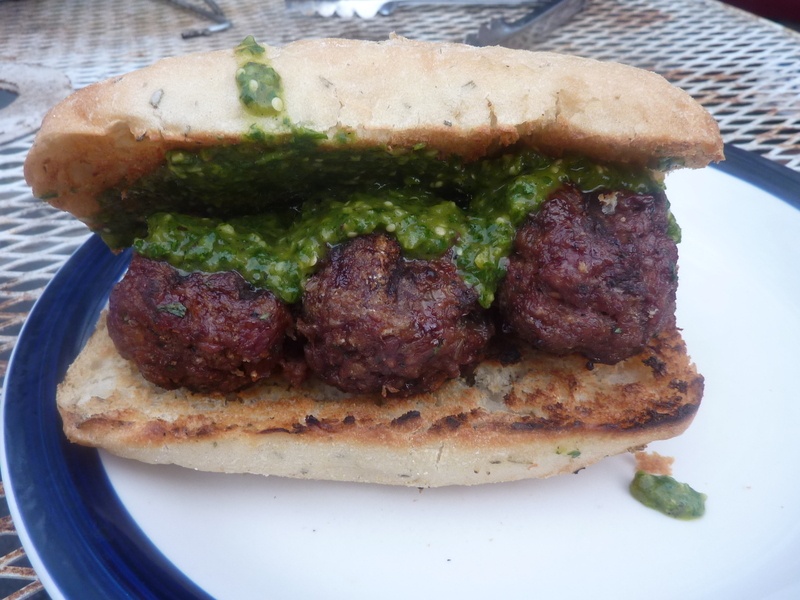 Preheat your grill to medium-hot. Make sure your grill grate is clean and very hot. Spray the grill with non-stick cooking spray. Add fish, removing any lemon wedges stuck to the bottom and placing on top. Let cook, without touching for 5-8 minutes. Using a spatula and tongs, carefully un-stick the fish from the grate of the grill. Let cook another 3-4 minutes, for a total of 8-12 minutes. Remove the lemon wedges from the top of the fish. Carefully flip the fish. Replace the lemon slices and cook another 5-8 minutes before carefully un-sticking from the grate of the grill. Cook another 3-4 minutes. When cooked through, the flesh of the fish should be opaque and semi-firm to the touch. 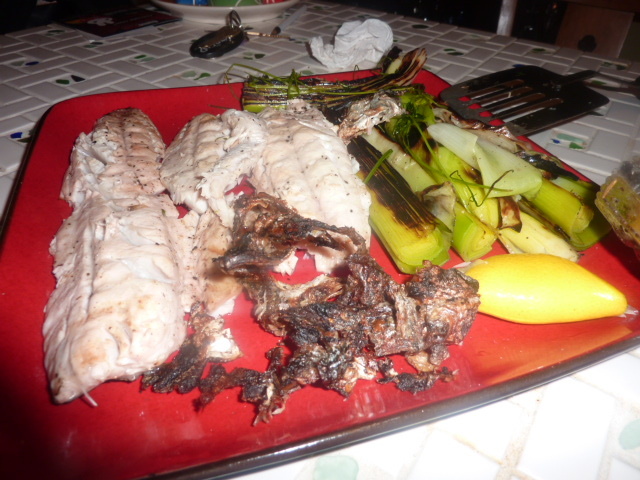 The skin of the fish will be darkened and even charred in some areas, and the internal temperature should reach 140º. Carefully remove to a serving dish and serve immediately with another lemon for squeezing. Take corn and pull back outer green husks without removing them. Remove the silk of the corn and discard. Brush the kernels of the corn with olive oil and season with kosher salt and freshly cracked black pepper. Reposition the husks back over the kernels. Place corn on grill heated to medium heat. Grill approximately 20 minutes, turning as necessary to keep from charring, covered. When cooked through, the corn will flex in your hands without breaking (be sure to wear oven mitts), the husks will be darkened and charred in places, and the kernels will slightly darker in color and tender. I very nearly opted against posting this recipe, because it’s just so darn simple. 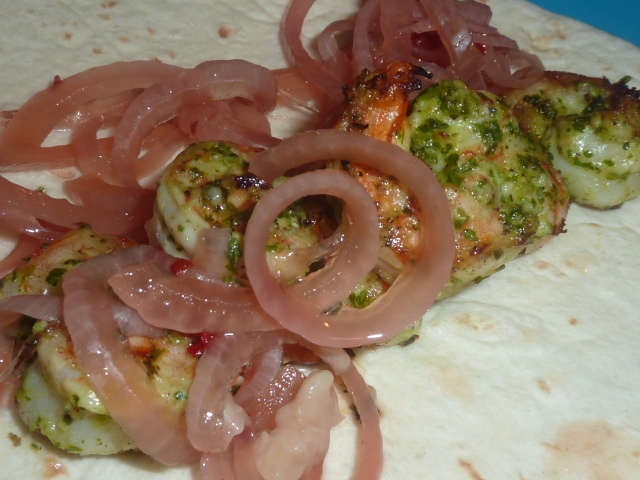 A quick and easy marinade is whipped together and then the ingredients are thrown on the grill. 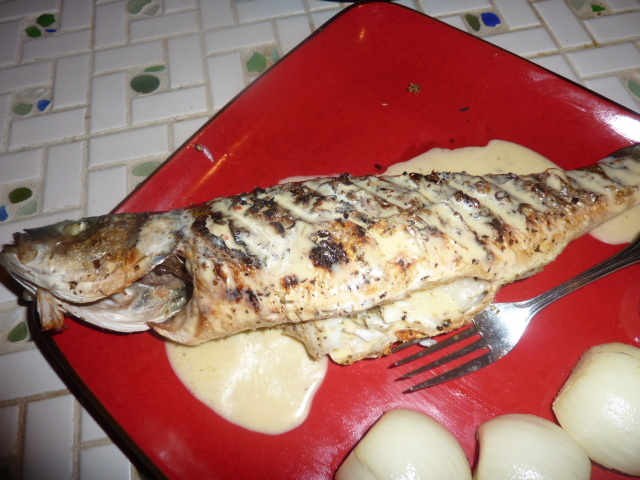 However, the combination of flavors from the striped bass and grilled leeks was so harmonious I figured it would be a shame not to share it on the off chance some of you were interested in a quick, easy, and healthy meal to throw on the grill. The melted leeks are particularly fantastic – I ate them like string cheese by pulling apart the layers and popping them in my mouth. A more civilized human – like Zak – would use a fork and perhaps a knife. As you can see from the picture, the skin of the fish got stuck to the grill grate. I pulled it off with some tongs so I could have some of that delicious, salty crunchiness. If you’re a touch more careful than we were, it shouldn’t be an issue, however. Mix together all ingredients except non-stick cooking spray in a large ziplock bag. Marinate fish 3-4 hours, flipping over occasionally to ensure even marination. Remove fish from marinade. Reserve lemon-dill marinade. Lightly score the fish on the skin side. Place fish skin side down on the grill. Baste with reserved marinade. Grill about 4-5 minutes. Carefully flip and baste again. Grill another 4-5 minutes or until internal temperature is about 140º. Meanwhile, cut a few 2-3″ slits about a quarter of the way through the leeks, lengthwise. This will allow the leeks to cook evenly. Blanche leeks in the boiling water about five minutes until tender. Drain rinse with cool water. Drain on paper towels. Place leeks directly on the grill. Baste with some lemon-dill marinade, from above. Cook about 5 minutes per side over direct heat. Transfer to indirect heat and cook another 8-10 minutes, turning once or twice.